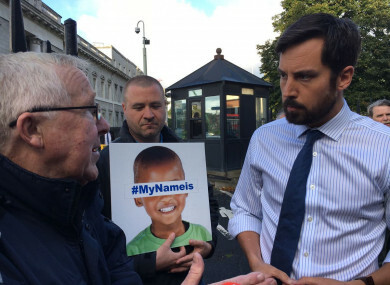 TWO KEY ORGANISATIONS working on the frontline of the housing crisis have criticised Minister for Housing Eoghan Murphy, claiming they have been unable to get a meeting with him to discuss solutions. On 8 September, the minister held a summit with the heads of 31 local authorities to discuss the crisis. A number of measures were announced, including the establishment of a homeless inter-agency group, a further €10 million in funding for family hubs and 200 additional emergency beds for Dublin. On the day of the summit, Anthony Flynn, CEO of Inner City Helping Homeless, confronted the minister outside the Custom House, telling him his organisation had not even had “the respect of a reply” from Murphy’s office. Flynn said that over a three-month period his organisation had more than 13,000 engagements with homeless people. For our opinion not to be taken on board when we’re dealing with such a high volume of people, he’s letting himself down. He said his relationship with previous housing minister Simon Coveney was “strong” and described him as “reactive to the situation”. “With each of his [Murphy's] predecessors, whether or not we agreed with them or got on with them, they listened to us,” Flynn added. Then on Monday, chairperson of Threshold Aideen Hayden told RTÉ’s Morning Ireland she was disappointed that her organisation – the largest charity dealing with the private rental sector -”hasn’t had the opportunity to meet the minister and share our views with him in spite of a number of requests”. The charity’s CEO John-Mark McCafferty told TheJournal.ie that while the charity has met with department officials on “very specific things”, there has been no move towards arranging a face-to-face meeting with the man in charge. “In those meetings [with officials] we’ve reiterated our desire to meet with the minister to convey solutions we have,” he said. It’s private rental sector tenants who are becoming homeless. We’re not seeing the same kind of volume coming from mortgage defaults into homelessness, it’s people being priced out of the rental market. There is a high level of tenancy terminations and the lowest level of available rental units right now. And we are absolutely in the eye of the storm. “It is very worrying that a key organisation at thecoalface, which already has a relationship with the State by virtue of being funded by it, and which provides essential services linking with vulnerable households and families, isn’t being asked for input,” he said. McCafferty said Threshold’s focus is on preventing people from becoming homeless - something the government has said is a key part of its plan to tackle the crisis. The organisation has “evidence and insights and cases to feed into the policy-making system” that it wants to pass onto the minister. “I’ve been in other organisations where I’ve sought meetings with the minister of the most relevant department and this is arguably the most difficult situation in terms of trying to make that breakthrough,” he said. June Tinsley, Barnardos Head of Advocacy said the charity “hasn’t had any engagement with Minister Murphy or the department in relation to the homelessness crisis”. This week, as part of the charity’s national collection day, it highlighted the negative impact homelessness can have on a child, with CEO Fergus Finlay, commenting that children “are being robbed of their childhoods”. Tinsley said the charity did contribute to the formal review of the Rebuilding Ireland Action Plan and included recommendations in its pre-Budget submission for addressing child homelessness. “We would welcome any opportunity to discuss the crisis, its impact on families and children and potential solutions with the minister or the department,” she said. Despite criticisms from some groups, other homeless charities told TheJournal.ie they are satisfied with the level of interaction they have had with the minister. Francis Doherty, head of communications for the Peter McVerry Trust said the organisation has met with Minister Murphy on five occasions since he came to office. “The most recent was last Thursday – Pat Doyle [the charity's CEO] met him prior to the summit with the chief executives of the local authorities. “We’d have fairly regular interaction with his office and with the minister. He’s done some of our events and we’ve had face-to-face meetings with him. He’s given everything an open hear, he hasn’t been dismissive of any views or ways of addressing the crisis,” he said. Brian O’Gorman, chief executive of Clúid Housing, also said he met the minister with a number of other housing associations the day before the summit with local authority heads. “I am due to meet him again when he opens a new older persons housing scheme that we are completing in Cabra, Dublin City,” he said. Focus Ireland’s director of advocacy Mike Allen said his organisation has had two meetings with Minister Murphy, which he described as “useful exchanges of views”. However, he said the charity “would welcome a more regular collaborative approach”. The Department of Housing, Planning and Local Government tole TheJournal.ie that the minister “plans to meet with both groups [Threshold and ICHH] in the near future when diary commitments allow”. Email “Those on frontline of homeless crisis say the Housing Minister won't meet them”. Feedback on “Those on frontline of homeless crisis say the Housing Minister won't meet them”.